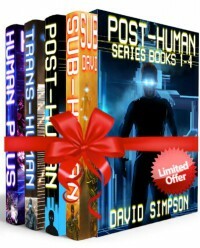 The Post-Human book series of 4 books is really a (at this time) a four book set. I am choosing to offer my review on the first 4 book set since I think that better serves the reader. The first book in the series was really written as the third book. It is a prequel which introduces the characters, primarily the old-timer. I found this book pretty essential in understanding the series. I thoroughly enjoyed this book and give it a 5 star rating. The second and third books are much different from the first. In a prologue from the author, the reader is told that they will need to release any conceptions they have of the future as it is impacted by technology. A very accurate statement as these books are what can happen if Moore's Law is fully accurate. I found the story in these books to take a bit of thought and acceptance. After all, this is a somewhat cerebral science fiction series. What I can tell you is that David Simpson can write and challenge the reader. I surmise that he is a very bright individual that has the ability to speak to the masses. I give these two books 4.5 stars. The third book is absolutely amazing. The same character set is still involved but you will not know it for some time. There are some very interesting plot changes in this book that should get to you and have you mumbling to yourself that the author has constructed a believable roller coaster of a ride that you could never see coming. I rate this book 5+ stars and look forward to reading his other books. Highly recommend to science fiction readers that are looking for something other than alien attacks.